Roasted Fingerling Potatoes are are roasted to perfection with crunchy edges and creamy, sweet fluffy insides topped with sun-dried tomatoes, garlic and fresh herbs. A simple side dish for everyday that packs a flavor punch! If’ you’ve followed me for a while it’s pretty obvious I love all things potatoes. Today’s recipe for Roasted Fingerling potatoes is one of my new favorites! They are crazy easy to make which makes them ideal for entertaining but unlike so many simple recipes you won’t suffer from anything boring with these little gems. They are loaded with bold, fresh flavors! This oven roasted fingerling potato recipe is not just a plain old potato recipe. You start with roasting the potatoes with salt and pepper to get them to just the right creamy texture. 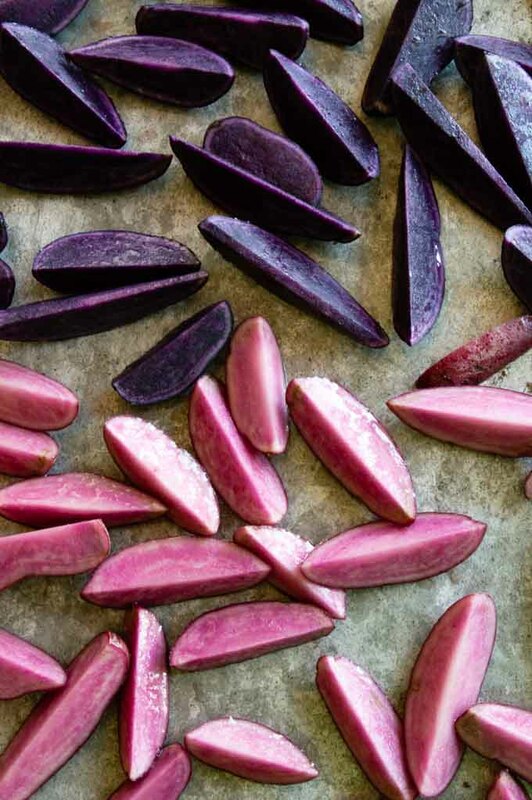 Fingerlings are perfect for roasting whole or cut into long quarters to give you more area to crisp. They are bite sized wonders: creamy inside, crunchy on the outside! Once you have a perfect crispy roasted potato you toss them in a rich sauce made with butter, garlic, sun dried tomatoes and fresh herbs. All the flavors meld together to give you a quick, easy comfort food side dish that will knock your socks off! ps…. make a quadruple batch of these, people will DEVOUR them! It’s time for Freaky Friday fall edition where I get together with a bunch of other food writers and share things from each other with the hopes that you find a new person to follow and find recipes you might not have every found!! I’m super excited to share with you a knock your socks off potato dish from Rini at the Healing Tomato. I currently am in California and have so many people with diet restrictions that we have over for dinner. Gluten free, dairy free, vegan, vegetarian, low carb, no carb…. the list is endless. I used to panic because I had no idea how to create recipes that followed a vegan lifestyle. I imagined boring vegetables with no flavor…. salads with just oil and vinegar… pretty much food just for sustenance not enjoyment. Then I found Rini’s website. Trust me when I say there is no lack of flavor in anything that comes from her. Check out her Cilantro Sauced Corn on the Cob, Blueberry Gazpacho, or these Beer Pretzels with Jalapeño’s. Look at all of those bold flavors in all of those recipes. I have made Rini’s recipe for roasted fingerling potatoes with sun-dried tomatoes as a vegan offering using her suggestion for Vegan Butter but Ive also made it with regular butter that I had on hand and honestly there was no difference in taste and my guests enjoyed it both ways. It’s nice knowing if I’m serving something to someone who follows the vegan lifestyle I dont have to make two separate meals ~~~I can serve the same dish to everyone! Fingerling potatoes are an heirloom tomato variety that are smaller, thin and skinny. They look kind of like fingers and hence the name. Unlike baby or new potatoes, fingerling potatoes are allowed to mature to their full size. They have a thinner skin but yield a nice bite after roasting. The centers are creamy and slightly sweet. They hold their shape well after cooking and are considered low starch/waxy potato. The fingerling potato is very versatile in cooking. Cut the potatoes into quarters. This also helps them cook more quickly. Toss the potatoes with a little bit of olive oil and salt and roast until crispy. While the potatoes are roasting make a sauce of sun dried tomatoes with jus, lots of garlic, fresh herbs. 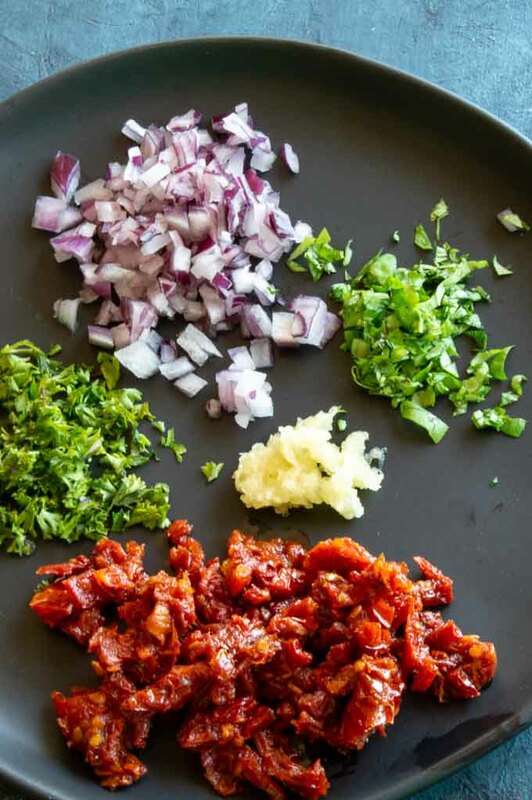 Cut the flavorings into small tiny pieces for quick cooking and even distribution. Toss the potatoes then serve immediately topped with fresh sprinkles of herbs. Simply beautiful sun dried tomatoes, garlic and fresh herbs for a perfect sauce! 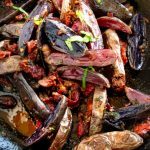 I love using the purple and red fingerling potatoes for added wow factor in the presentation, but if they aren’t available regular fingerling potatoes taste the same and work just as well. No fingerling potatoes available at all? Not to fret, baby or new potatoes will work perfectly. You can substitute what ever fresh herbs you have, is available or what you like. I used basil and oregano but dill, parsley, tarragon and thyme would pair beautifully too! Don’t have vegan butter but want to have it be a vegan offering? Use a little more of the olive oil that the tomatoes come in. I also added a fresh squeeze of lemon juice to brighten the flavor. Buy the sun-dried tomatoes in oil… the flavor is better and you wont have to take the time to rehydrate them. Cut the sun-dried tomatoes into small bits. 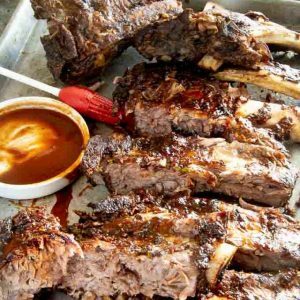 The flavor can be bold if you get a whole one and this way the flavor can be spread throughout the dish. 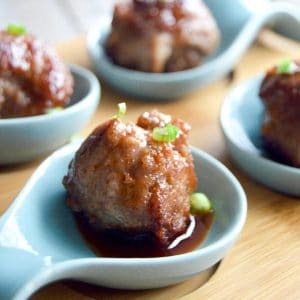 These work great as a side dish but they are also a nice filling appetizer to serve at a cocktail party. You can make these ahead and just reheat the potatoes at the last minute. Make the sauce ahead of time too, but store it separately. Toss the warmed sauce over the top right before serving so the potatoes stay crispy! 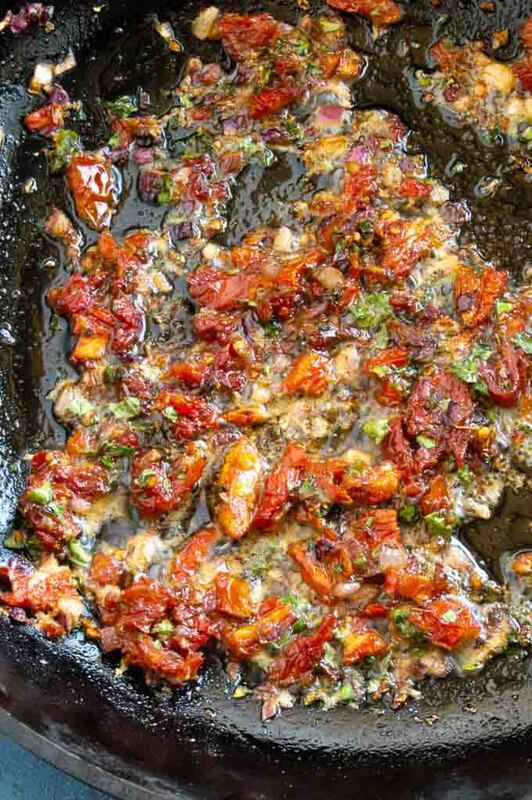 This sun-dried tomato, garlic butter sauce would be fabulous served on grilled shrimp, as a dipping sauce for bread or served over pasta. 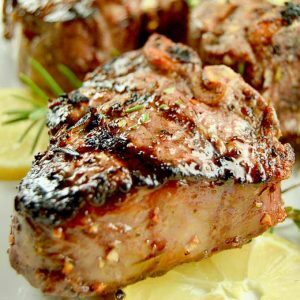 It would pair beautifully as a topping for steak, pork or chicken. Ive used it to make a savory baked brie appetizer that my guests devoured and used it over green beans but it would work for any roasted vegetable too! It’s just so versatile! Add the garlic, onions and sun-dried tomatoes to the pan. (feel free to add a couple of tablespoons of the juice from sun dried tomatoes jar. sprinkle additional fresh herbs over the top before serving. 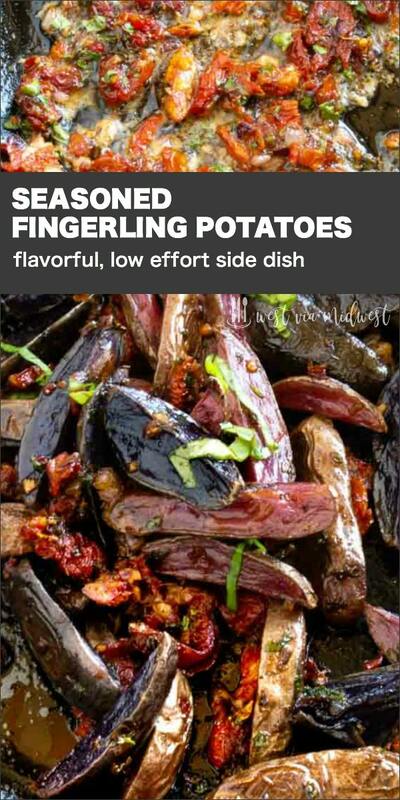 I seriously need to get some fingerling potatoes because this recipe looks AMAZING! I roast potatoes all of the time — but you have seriously kicked up the potato roasting game with these beauties!! What a tempting recipe! I’m definitely going to give these a try, hoping to find some at the Farmer’s Market this weekend! This is definitely worth a try! Looks so good! I’m so excited to try this recipe! I love sundried tomatoes and potatoes! What ana amzing side dish! I love that you make a coating with sun-dried tomato! 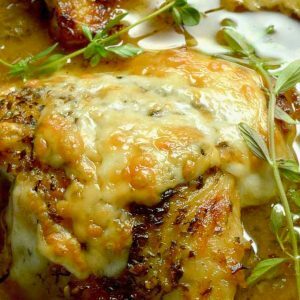 I have never sauteed my coating before tossing it in the oven, so I must try this! You had me when you said sundried tomatoes and garlic! Delicious!!! Oh God, what a tasty looking this Roasted Fingerling Potatoes is! I am in love with the colors and how simple and short the ingredient list is. Yum! Oh my gosh! You did SUCH A WONDERFUL job with this recipe. I am practically drooling at these pictures. 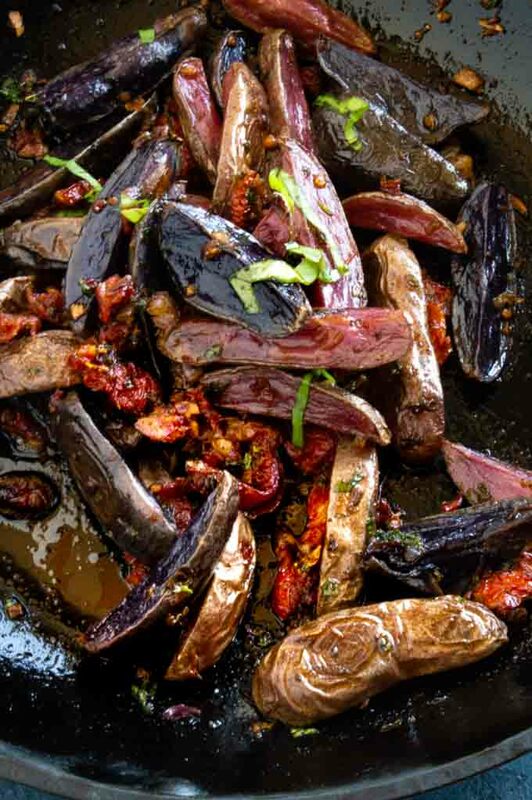 I love LOVE that you used purple fingerling potatoes. They make this recipe that much more colorful. Thank you for all the wonderful compliments about my blog. 🙂 I am truly flattered. Coming from you, that’s high praise. These potatoes look amazing! I love sun dried tomatoes and never thought of using them this way. Great idea! Oh my goshes, these sound just amazing! What an explosion of flavor for a super tasty side dish. On the list – we’ll love it I’m sure!! Seriously, just wow!! The flavors sound amazing!! I need these potatoes in my life asap! I think you picked a winner of a recipe for sure! Rini is such a talent! Roasted veggies are by very favorite! Oh my! There is so much goodness going on with these potatoes! I have a serious weakness for potatoes, so I can’t wait to try these! These potatoes look fabulous! What a delicious side dish – although I must admit I am well know for eating smashed or roasted potatoes as my main dish because of the deliciousness factor! I am definitely making this dish soon! I love fingerlings and these sound fabulous! I love roasted potatoes of all creeds, colors, size, and varieties. 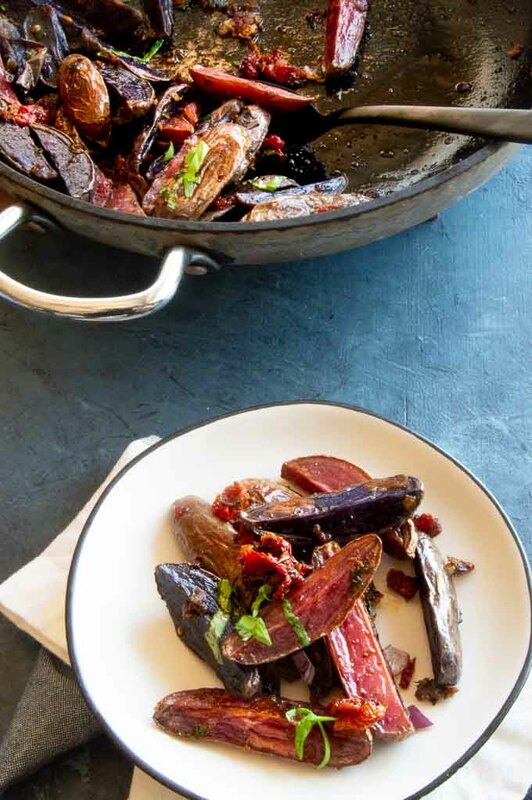 I have never seen any that look more appealing than these roasted fingerling potatoes that you have covered from Rini, also one of our favorite online foodies! Fantastic job, as always!